At just 24 years old, Jake Moslow is an anomaly in his trade. The few fellow custom sign painters that remain have been in the industry for decades, many nearing retirement. But the creative force behind JM Signs can be found in his Black Rock studio working at his drafting table or 20-foot easel doing everything by hand—just like the old-timers. He grew up on the city’s West Side and discovered sign painting four years ago when a friend of his experimented in the business for a few months before becoming a tattoo artist. He bought his friend’s brushes, but didn’t pick them up for almost a year because he felt intimidated by the talent of Buffalo’s other sign makers. When he finally started, he went door-to-door on his bicycle looking for work and when he landed a job, he would do the work in his garage. He slowly built his business, exploring everything from wooden signs to applications on glass to lettering on cars and boats. He now has his own van and workspace that he shares with friend Jordan Kubik, who repairs and sells bicycles. His handiwork can be found all over the city—original works and faded signs he’s restored. 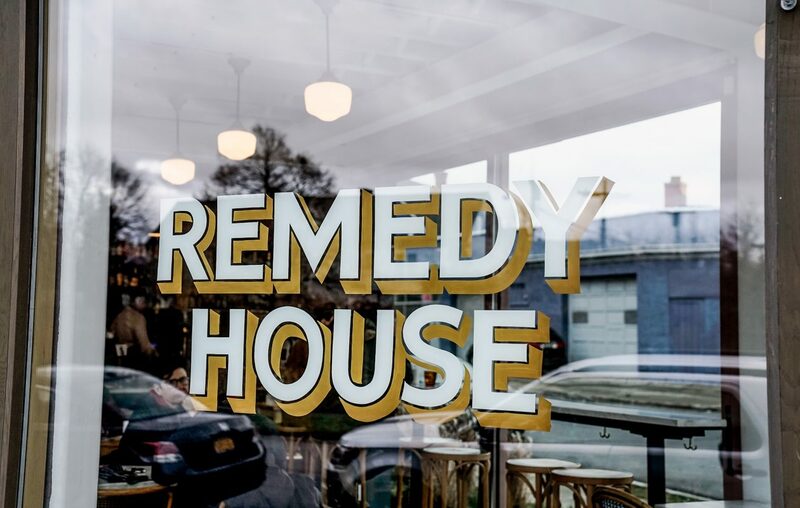 Some of his best known original pieces adorn the windows and frontages of places like Public Espresso + Coffee and Remedy House as well as Oxford Pennant, Atomic Barbershop and Queen City Antiques. Show and tell. The first step in any sign that he makes is finding out exactly what the customer wants. Sometimes clients have a very specific aesthetic and color palette that they desire, other times they rely on Moslow to make the creative choices. He usually sketches a small mockup to show a client for their approval. Most of the signs he creates in the shop are done on wood, but he occasionally works on metal and glass as well. Depending on the complexity of the design, Moslow will use one of two approaches. Lay it on me. For simple signs, Moslow draws the design freehand in either grease pencil or chalk directly on the wood or metal. But for more complex designs, he’ll work in conjunction with a projector and a large piece of paper to trace it. Pounce on it. For other signs, Moslow uses a pounce and chalk to transfer his design. He traces over his sketch with a pounce, a small tool that pokes holes into the paper, to make the impressions. Then he goes over the whole thing with chalk, rubbing it onto the original to transfer through to the wood panel behind it so that he can then draw over it. Color me beautiful. Once the design is outlined on sign, Moslow hand mixes the paints he needs to colorize it. He generally uses enamels to paint outdoor signs, creating the exact hue he desires in his workshop. “I drive myself crazy with colors,” he said. Time to paint. Moslow says that keeping a consistent amount of paint on your brush and on the sign is one of the most challenging parts of each project. To help, he sometimes uses a tool called a maul, which is a bar with a ball on the end. It allows him to make straight lines and do fine detail work while keeping his hand off the sign.